The calm resettles. 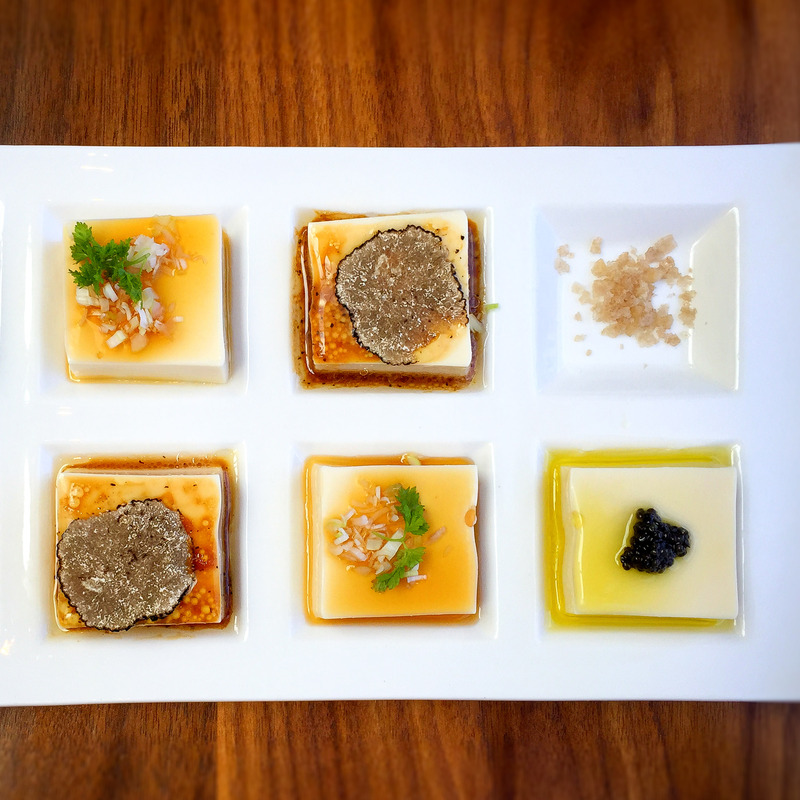 A plate of tofu arrives, a study in Zen: six perfect squares of soft, quivering bean curd alternately topped with black truffle, caviar and ginger. It tastes like pudding. It tastes, oddly, alive. Fleetwood Mac plays gently on the stereo. Or maybe it’s a tribute band – the vocals sound amiss. It doesn’t matter. 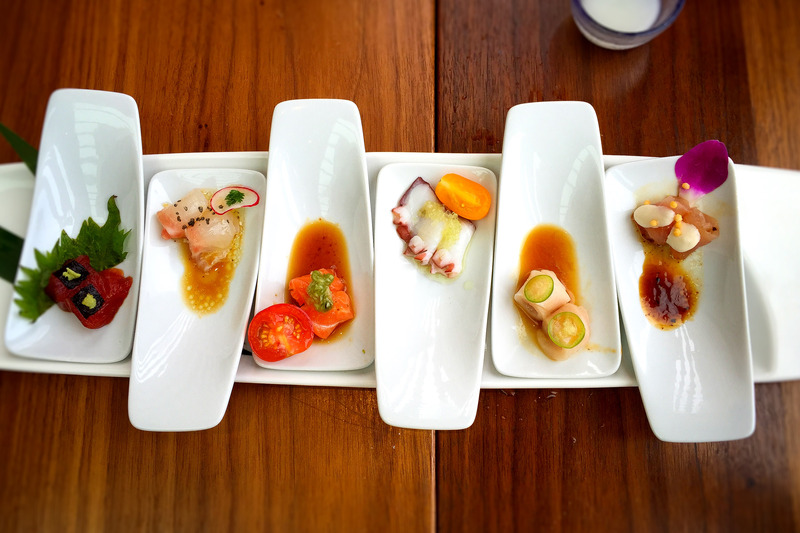 The scene at Sushi Roku is warm and inviting in the languid midafternoon on a weekday at Fashion Island. Indirect sunlight casts a warm glow, and for a moment the fake bonsai trees look real. “Arrow Shay!” responds a waitress. They all pronounce it differently, so drastically that I pull my waitress aside to ask what they’re saying. “It’s a Japanese welcome,” she says, stating the obvious. “It’s spelled i-r-i … i-r … you know what? I have no idea.” She laughs and walks away. This is the sixth branch of a restaurant chain that started in L.A. more than a decade ago. The original was a scrappy sushi joint that grew into a swanky celebrity magnet. This outpost is bigger and far more elegant, but with a menu that is almost identical to the original. Chef Shin Toyoda moved down from Hollywood to run the kitchen here. “Are you going to stay in O.C. ?” I ask one night when I’m sitting at the sushi bar. “Yes,” he says. When the chef asks me what I want to eat, I tell him, “omakase,” letting him know that I’m ready to eat whatever he prepares. Toyoda sends me a steady succession of new-style sashimi: a near-translucent scrap of fluke topped with kumquats and citrus vinaigrette, Hokkaido scallop with yuzukosho (chili pepper paste), and bluefin tuna paired with Italian summer truffle and Parmesan, all of it excellent. As terrific as everything is this night, none is actually better than nor as beautiful as the composed sashimi or sushi samplers from the regular menu. Those are wonderful mosaics of contrasting tastes, colors and textures, each piece uniquely garnished and Instagram-ready. As sushi restaurants go, Roku has always been unapologetically American, emphasizing hand rolls and new-style sashimi over nigiri or omakase. I don’t normally eat American-style rolls. More often than not, they are made with yesterday’s fish. Rolls are for amateurs. Celebrity bait. Rolls are for people who don’t like the taste of fresh, raw fish. I go to sushi bars to enjoy the subtle nuance between horse mackerel and Spanish mackerel. I marvel at the progression of three different clams. But while that’s not what this place does, Roku rises above the typical celebrity bait. 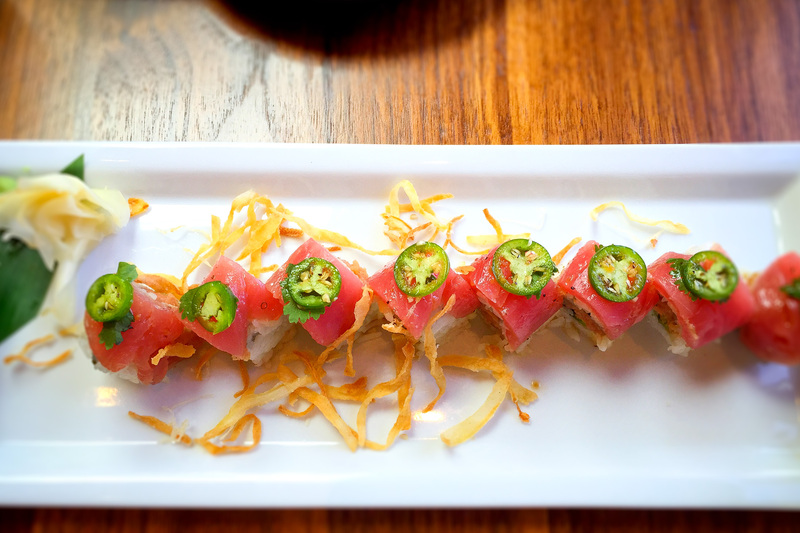 The signature tuna jalapeño roll is fantastic. It tastes of fresh, raw, pristine tuna, the creaminess of which plays gently against avocado, followed with a faint whisper of yuzu-infused olive oil. Aside from rolls and sashimi, the kitchen specializes in small plates, both hot and cold. 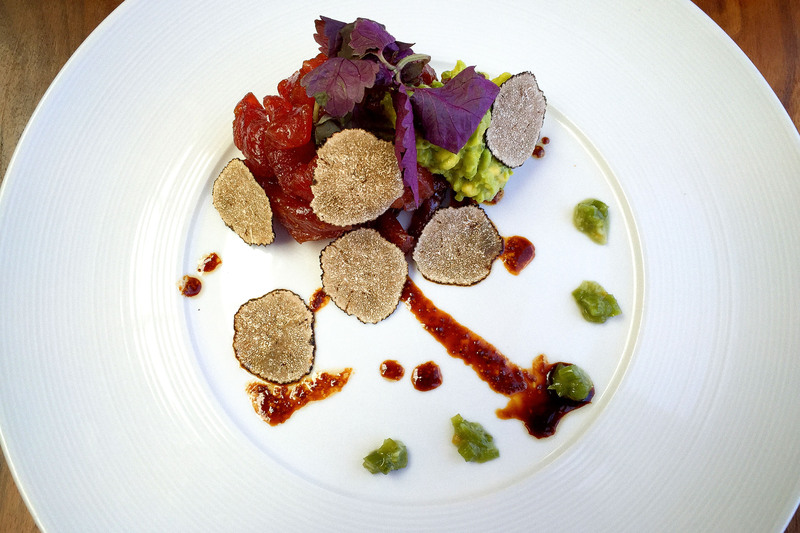 Tuna tartare is excellent, garnished with summer truffles. 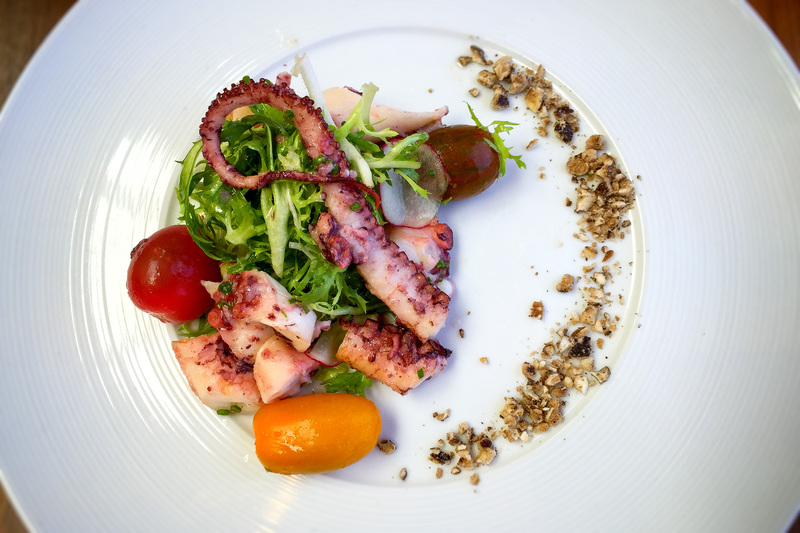 Grilled octopus stars in a beautiful salad with dried mushrooms. Fried chicken is so tender and juicy, it could be mistaken for Rocky Mountain oysters. Braised beef short rib is meltingly tender, served with fried bok choy. Brussels sprouts deliver the unctuous umami of caramelized soy sauce. Roku borrows a few robata-grill recipes from its sister restaurant, Katana. Skewers of wagyu beef glisten under a slick black-pepper glaze. Filet mignon is stretched around foie gras and asparagus and grilled until the liver turns into a miniature water balloon ready to burst. Some of my favorite dishes come from a catch-all section labeled “soups, noodles and rice.” A bowl of ramen delivers a silken pork broth that would be far too delicate for a throw-down against, say, Ramen Yamadaya, but put them in a beauty pageant and here’s your winner. Order the flat soba noodles, and go alone when you do. You will instinctively guard your plate like a wild dog. The noodles cling to a rich cream sauce that’s made ever richer with an embarrassment of sea urchin roe. The uni breaks apart as the noodles are tossed, scattering into a constellation of tiny orange speckles. The menu offers only four full-sized entrees, and the kitchen would be wise to scratch these altogether. None lives up to the small plates. The steak is a saucy, garlicky mess, a total waste of a decent piece of meat. The chicken is woefully overcooked and dry. “Irasshai!” echoes through the dining room again. Cocktail hour is now in full swing. The pace of that greeting increases to several shouts a minute, like a game of Japanese Marco Polo reaching a climax. Like other fancy restaurants at Fashion Island, this one, too, turns into a nightclub for the rich and famous after sundown. I hate that. Fortunately the Jekyll-and-Hyde transformation is not nearly as severe as with Fig & Olive or Red O. And throughout most of the day, this place is a joy. 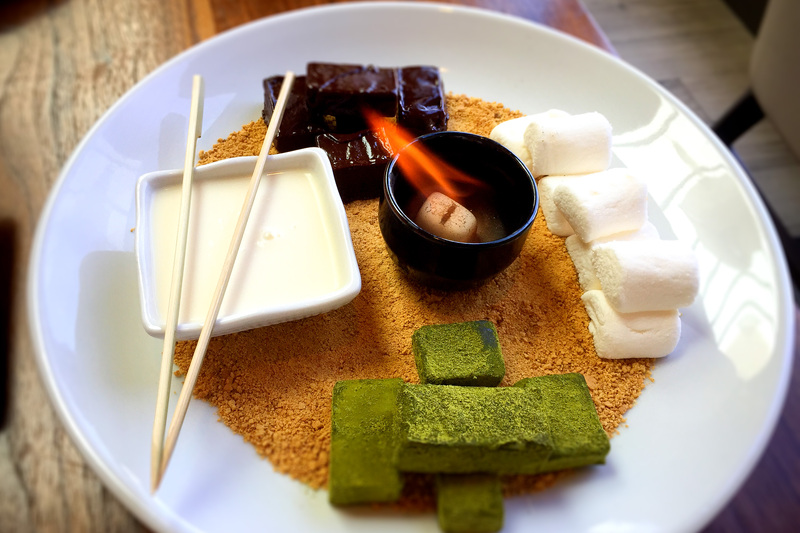 Don’t miss: Sushi and new-style sashimi samplers, A-5 wagyu toban-yaki, grilled octopus, Tofu 3 Ways, green tea s’mores. Best place to sit: Front dining room, or the large booth facing the sushi bar. About the noise: Pleasant most of the day; very loud after 8:30 p.m.
County health inspection: Not yet available online. Cost: Small plates $3-$60 (average $9-$17), large plates $25-$41, desserts $10-$14. Valet parking $6. Corkage $25.